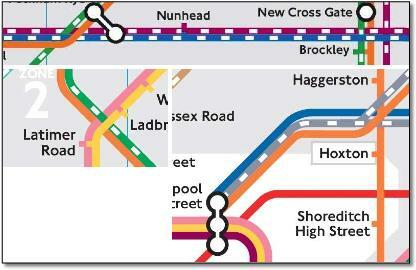 With New Cross and New Cross Gate error (should have been NCG only). 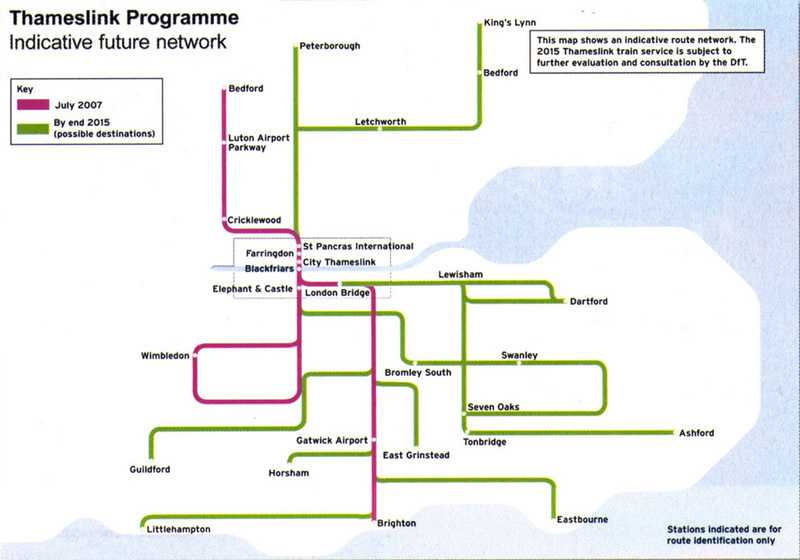 Note the wrong overlaps on the three sections of the May 2015 TfL Rail and Tube map. Most of the time the different TOCs are running on the same track but are shown to go both over or under lines they cross. 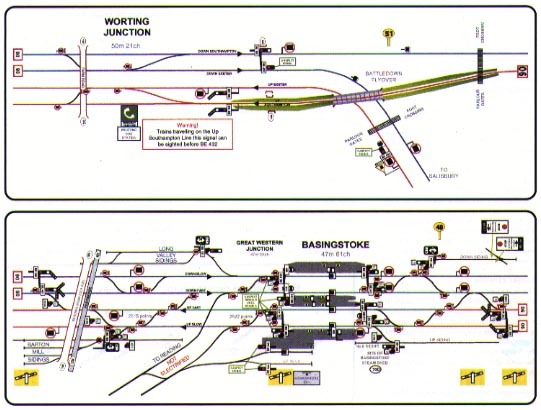 Clapham Junction and Woking transposed. From the sublime to the ridiculous. Left to right, a rendition (complete with eight arrows) as a square; a ridiculous square necked bottle shape; a fairly poor rendition of what is in reality a simple balloon loop but could be interpreted due to poor cartography as a circular route too; a poorly drawn circle. So Lincoln and Leeds are on the main line and Inverness is served from Glasgow? 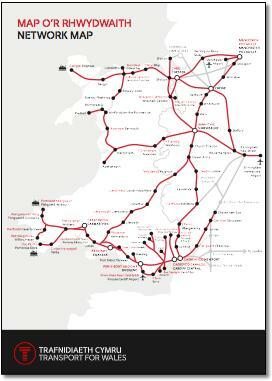 Vale of Glamorgan and Ebbw Vale lines not shown. 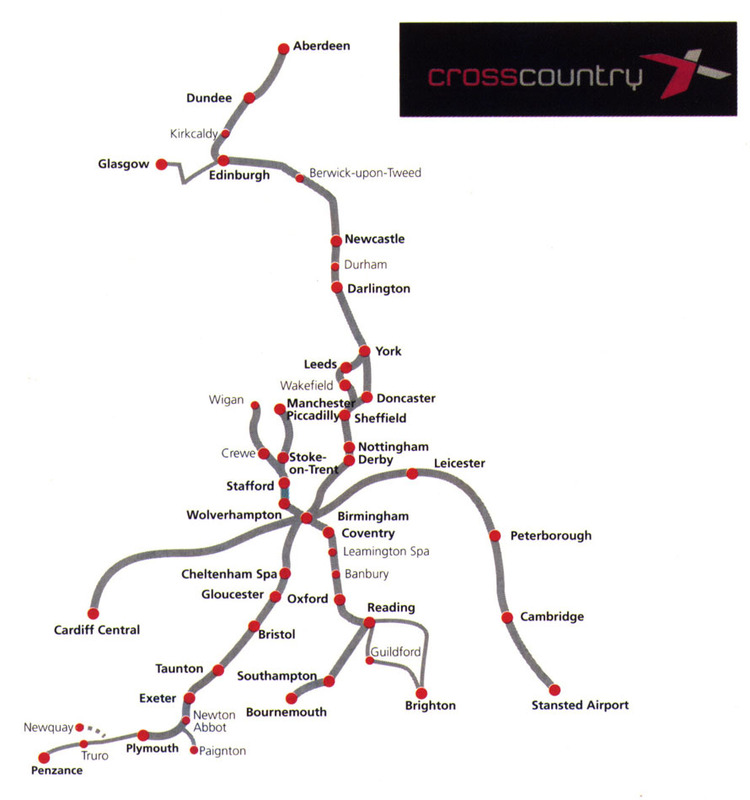 West Coast main line shown to include Kidsgrove-Crewe (only a diversionary route), Manchester Airport branch and Northampton loop yet Stafford-Rugeley or main line through Handforth not included; Wigan North Western not identified. 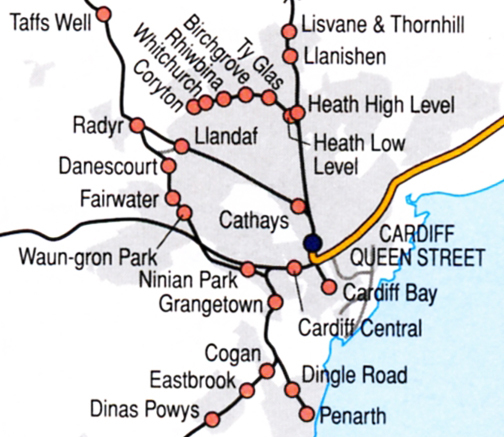 Great Western main line shown running into Cardiff Queens Street (shown in inset); Exeter Central shown as the major station rather than St Davids. 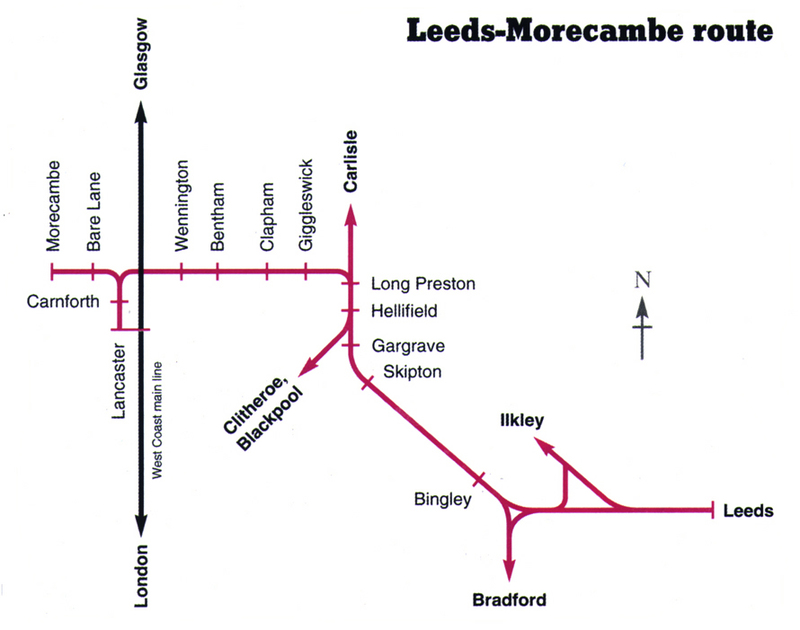 East Coast main line shown running into Wakefield Kirkgate rather than Westgate - and then not running on to Leeds (shown in inset); layout completely wrong at Lincoln and Gainsborough; missing Stallington curve. 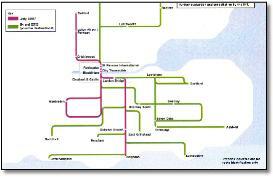 Gt Eastern: Reedham and Colchester Town junctions wrongly shown. Birmingham: no Jewellery line or Smethwick Galton Bridge station. Manchester: New Mills Central shown on Disley cut-off. Glasgow: missing curve between Milngavie and Annisland; junctions wrong around Holytown. Eurostar: closed CTRL1 link from Gravesend shown; Stratford shown but not open for a few years and then as a separate station. London: shows West Hampstead on the Marylebone line; shows the North London Line missing Willesden Junction; shows Brixton on the South London line; and all those missing or unidentified stations: Farnborough North, Kentish Town West, Gunnersbury etc etc. 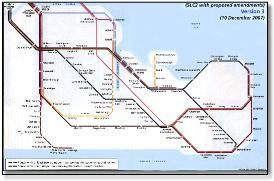 Poor execution of junctions (even though there's a get-out clause on this) eg Dingwall shown correctly but Georgemas not; Carnforth and Newton-le-Willows shown on main line. 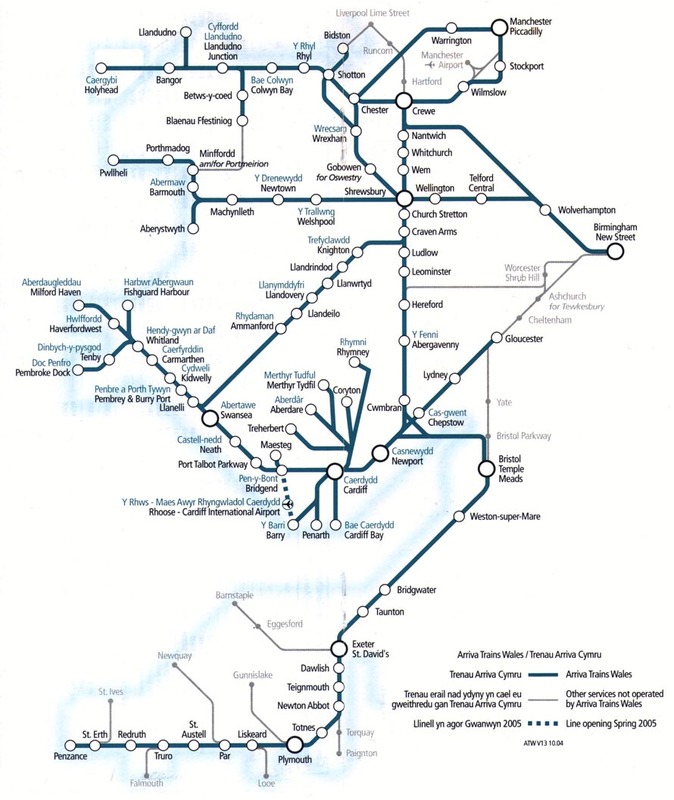 And then there is just poor cartography: Wrexham, Bedford and Worcester need explaining but no effort is made when there is adequate room to do so; angular route out of Fenchurch Street including a tunnel; inconsistent presentation of tunnels and their portals. Uh, Stratford and Aylesbury on the mainline? 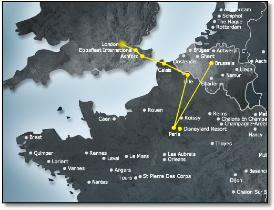 Strange route to Brussels! Depends on magnification of page, correct version below. 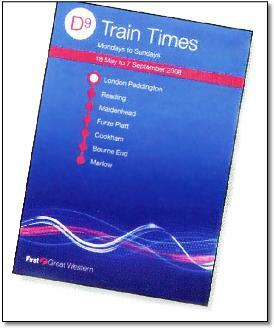 • Use of single interchange symbol causes confusion at Shadwell, Limehouse and Westferry on the 2007 version below - do Beckton and Lewisham trains stop there? On the 2008 version above Westferry is shown as a simple, non-interchange station, so it looks like Bank - King George V trains do not stop there. Also, the designers have correctly removed the East London Line yet have left the interchange circle - surely this is exactly the same situation as Westferry? 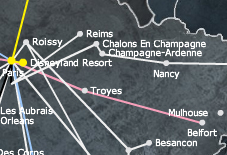 The map designers here are getting complacent taking the interchange symbol into further realms of meaninglessness. • Use of sharp curves means curve at West India Quay has three bends - like going around a 50-pence piece, and wouldn't the West India Quay - All Saints line be better vertical? • Messy zone overlap with patronising phraseology ('All stations in this area are in zones 2 and 3. Tickets for either zone are valid'). The few changes on this terrible map make it worse. 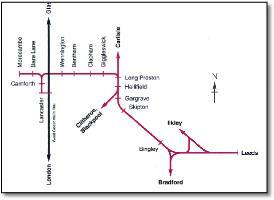 The Settle & Carlisle line is now shown as a straight line, good you might think, but at a new angle not used anywhere else on the map - and Hellifield is now wrong. St Pancras is now totally bizarre, their is a line from St Pancras to an unnamed station on Thameslink, scuttling around Kings Cross. 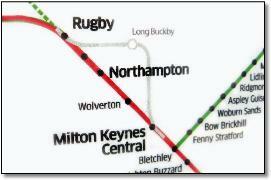 Shows Milton Keynes south of Bletchley instead of north. It also states 'some lines omitted for clarity', but they're all there - but say it, just in case. Shows Reading (not on the route) between Paddington and Maidenhead. Poor Marketing Department proof reading. Map is transposed 180º, putting Leeds in the west, Blackpool in the east, and Sowerby Bridge south of Huddersfield. Exactly what is the advantage of turning geography on its head? 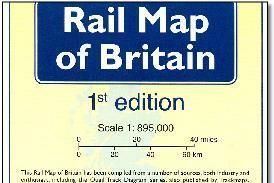 This is a classic example of a poor map of the type that makes what is simple on the ground unrecognisable. Since when did Kent look that - with a club foot? How a designer can play arbitrarily and unprofessionally with our understanding of how our land fits together is beyond me. Railways are the glue, they connect all the main points with straight lines of steel. 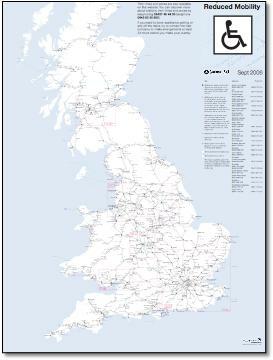 A motorway map shows roads that avoid conurbations, railways go from centre to centre. And lets not forget that. 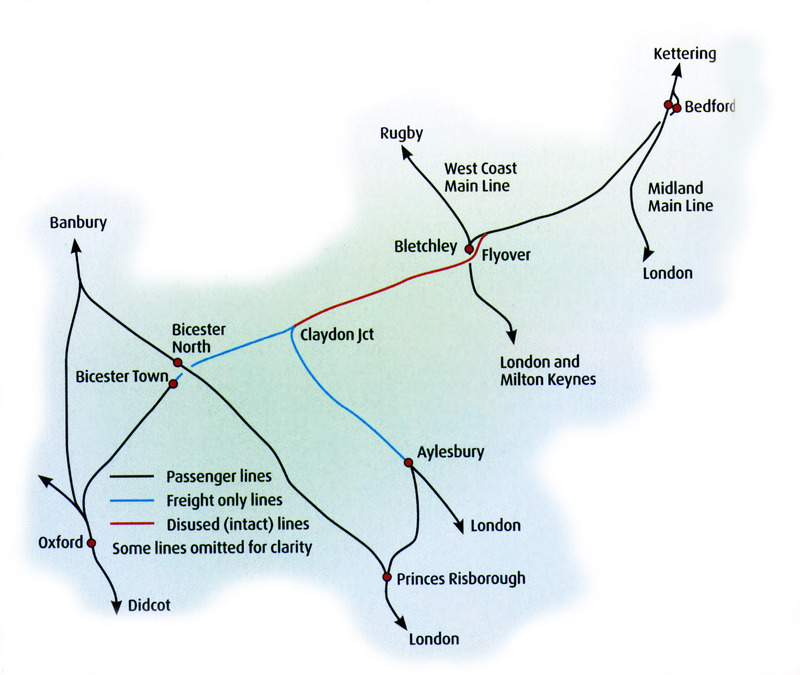 The map takes the straight and direct SouthEastern main lines (London - Tonbridge - Hastings and Tonbridge - Ashford - Dover) into convoluted multiple angles. The Tonbridge - Dover line is arrow straight (a superb piece of engineering by Cubitt) - why put four bends in it? Meaningless heading. And SLC2? Odd and gloomy colour-coding - not distinctive. 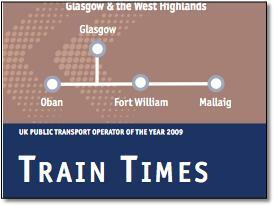 This map which appears in Scotrail timetables is two different maps joined together. 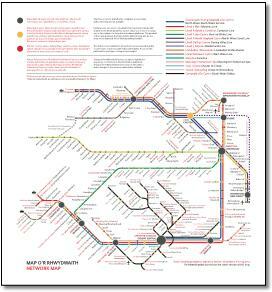 On the left, the Strathclyde map is single-colour (clockwork orange excepted) and shown as a network. 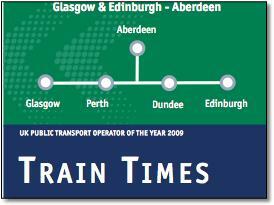 On the right, the Edinburgh services are identified as services and shown as colour-coded multiple lines. On the left, line-coloured ticks are used for stations and black circles for interchange stations. On the right there's a mixture of line-coloured ticks and dark blue strike throughs. Not only two different types of map but two types of symbolism. The BR double arrow symbol in the key 'interchange with othe operators' is only applied to Queen Street, Central and Motherwell - just what can it mean? The map has also been stretched vertically badly distorting it. 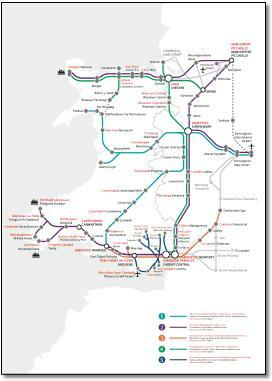 The key claims to show possible 3rd rail electrification but uses the same solid line as currently electrified lines, so you don't know what is proposed. 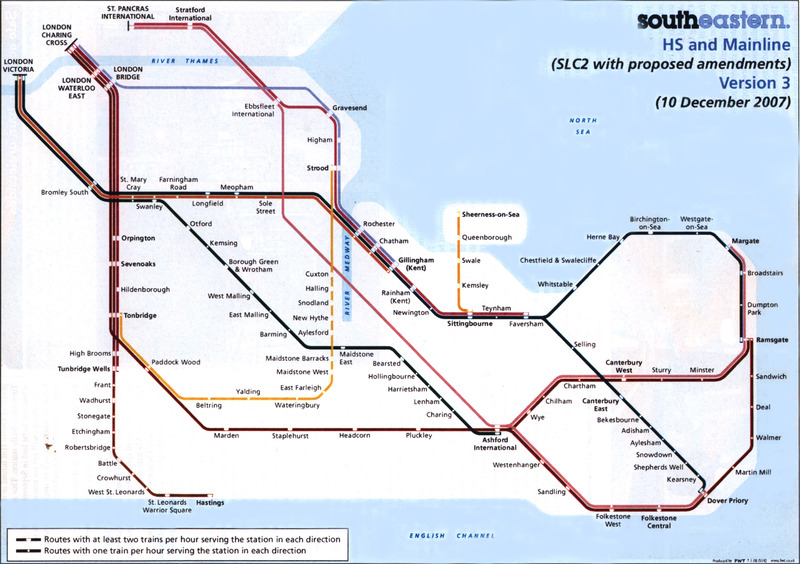 Shows a Burscough curve and new Southport service as though they exist, yet these are proposed. Shows Wrexham General as Central. 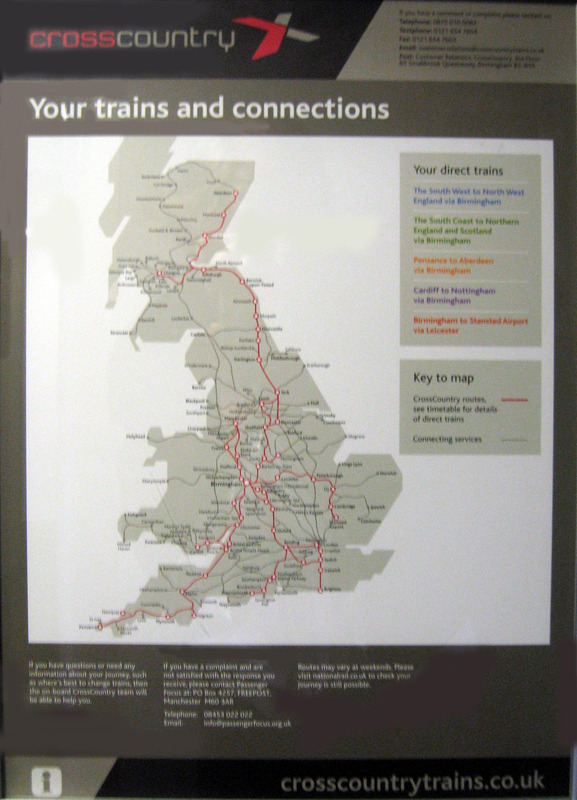 • Captions poorly positioned, inconsistent relationship between blob size and caption size (ie Crewe is light type with bold blob), odd spikiness at Carstairs when rest of map is curvy. 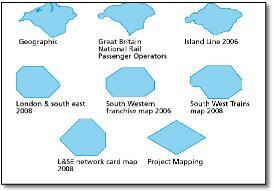 Different map makers interpret the shape of the Isle of Wight in completely different ways. 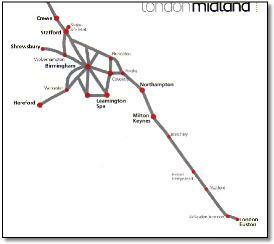 This London Midland engineering work map shows Northampton on the main line (with slipped caption), a rogue unidentified station and the Northampton loop incorrectly joining the main line at Milton Keynes instead of Wolverton. Something has gone wrong with the layers too. Geographic, but with added distortion, eg Exeter - Dawlish. No railways in Kent, although there are connecting services via Croydon and Redhill. 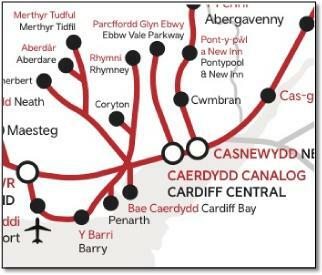 Central Wales line joins the South Wales main line to the east of Llanelli, not Gowerton as shown by Arriva Trains Wales on the back of their printed timetable. 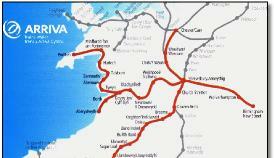 December 2009: ATW maps still show Gowerton in the wrong place. Hey guys, you need to know your patch. There is so much that is wrong with this horrible, horrible map, but picked out here is the treatment of the closed East London line. Is it necessary to show the three separate replacement bus services with all those full-sized interchange symbols? Add the bus symbols, ELW, ELP and ELC and the dagger symbol! Far too complicated. This section of track is part of the National Rail network. 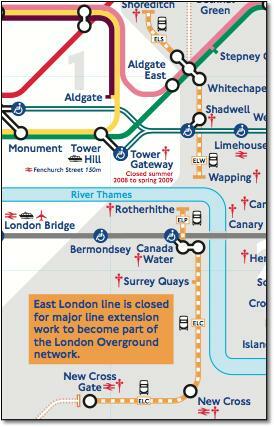 London Overground services will operate on this line from 2010. Oyster pay as you go is not currently valid on this line. Just leave it off and keep it simple. • Odd angular style with no link to geography or as a schematic, Coventry caption runs over line, Stoke shown right by Stafford. For years, all ATW maps have shown a hard edge to Anglesey but a soft edge to the mainland. Merthyr Tuyfil spelt wrong in English, should be Tydfil. • Patronising text, for example the childish 'Lines like this show where ferries go'. On the front main map ferry routes are shown, but on the back they disappear from the detailed schematic maps except on the Scottish one. • Wrongly shows Carnforth between Lancaster and Morecambe. 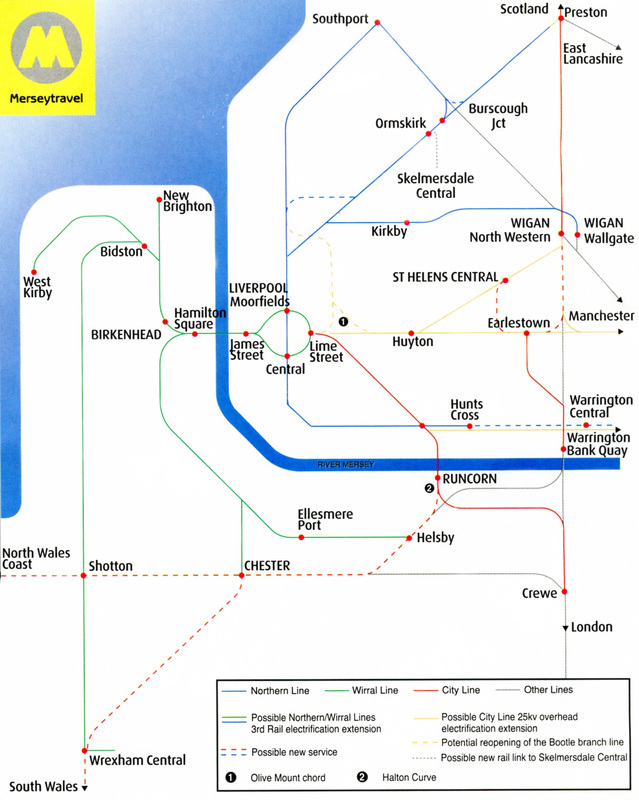 • Wrongly shows a line at Hellifield going to Blackpool, should be Blackburn. 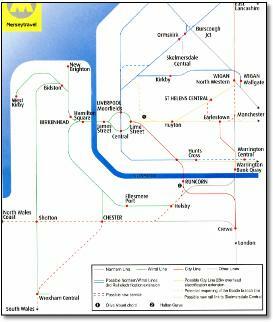 • The map uses an arrow to indicate other routes but inconsistently uses an end of line symbol at Leeds. • Strange to use bold type for destinations that are not the subject and roman for stations that are. Such a simple map badly designed. • Over stylised - or carefully crafted to look like a storage system at Paperchase? 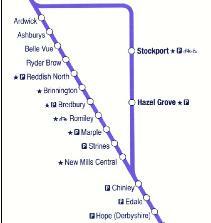 Romiley and Stockport routes transposed, Stockport actually west of Romiley route. Why? Corrected when seen February 2008. 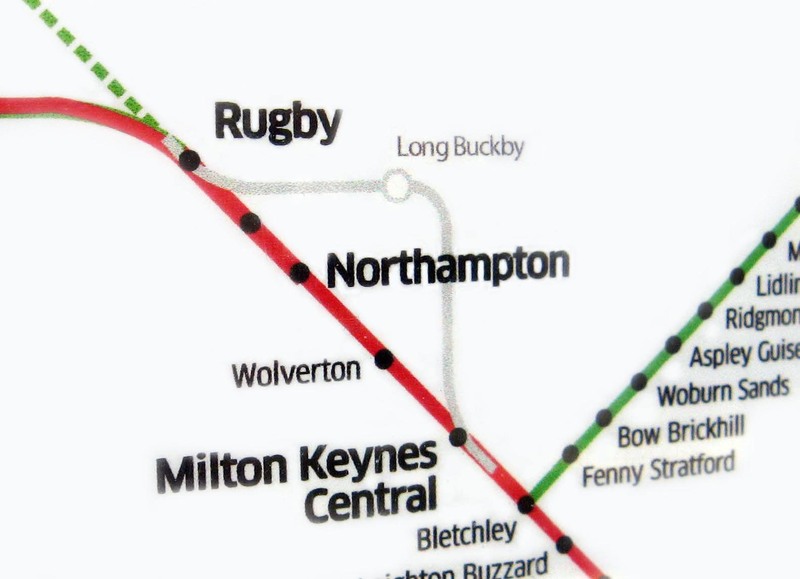 This map of Rugby is upside down showing south at the top, Northampton to the west and Nuneaton to the east. Isn't this the opposite of one of the most basic rules in map making? 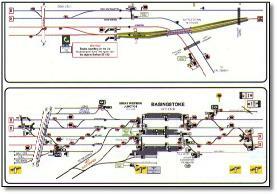 Spotting a trend, this signalling map of Worting Junction and Basingstoke is also upside down. And then the Nuneaton map. Mmn. 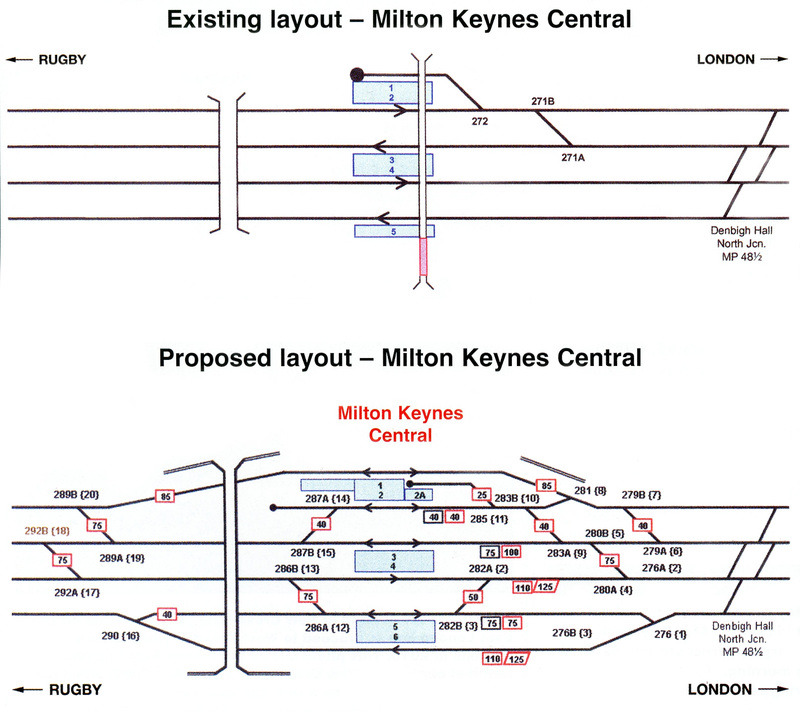 Subsequently Allan Williams emailed 1/3/08 to say that these diagrams are always 'as seen' from the signal box - and nothing to do with geography. 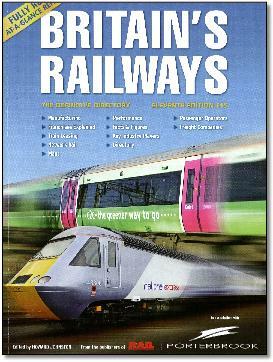 This was also what Nigel Harris at RAIL Magazine said. So why this map of Milton Keynes the right way up? Selection of dashed line styles for major operators (NXEC, FGW, London Midland and NXEA) makes them look less important than other lines (looking like a weekend only or limited service). No First Capital Connect south of London. Station selection misses out some very important locations even when there’s plenty of room (Chepstow, Welshpool, Bristol Parkway, Sleaford, Durham, Burnley, Yeovil, Gainsborough etc) and we have Barton-on-Humber but no Stockport, Warrington or Wigan, and why on earth two stations at Harwich? 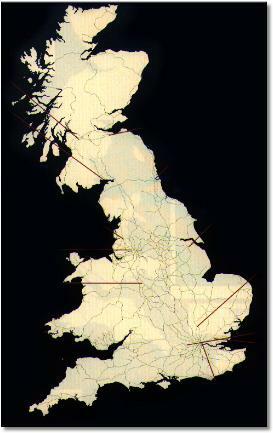 There is no detail in London, Manchester, Glasgow, Birmingham or Liverpool where the cartographer has just given up. Captions are poorly placed (see for example Newhaven and Seaford; Lichfield Trent Valley would be better as just Lichfield placed above). Pier Head Ryde rather than Ryde Pier Head. 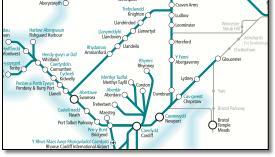 Station reversal is inconsistent (Swansea but not Camarthen). Horrible station circles and type face. The new Ebbw Vale branch and a rogue non-existent thicker line added - 6 branches compared with last years 4! 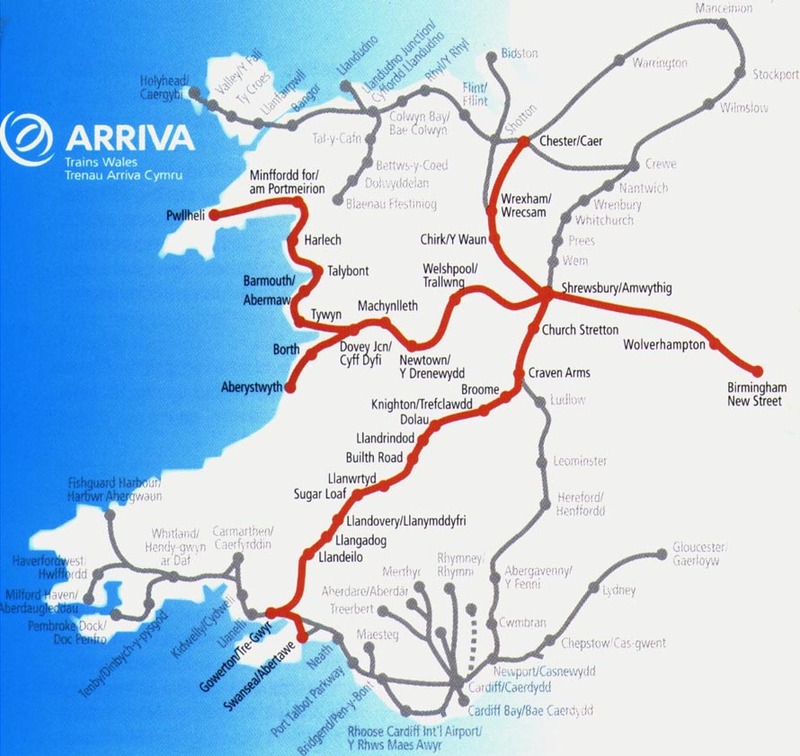 The three line weights are often wrong, for example Pembroke is operated by ATW and should be thicker, ditto Vale of Glamorgan and Fishguard. No important stations like Tilbury or West Ham? Or indication of the occasional service to Liverpool Street? 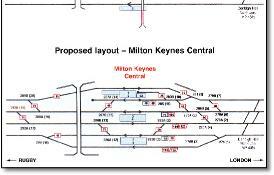 No route to Kidderminster, no indication of junction direction on Stratford branch; three line thicknesses on map, two in key; too early for Aylesbury Parkway to be shown, best bet 2010. 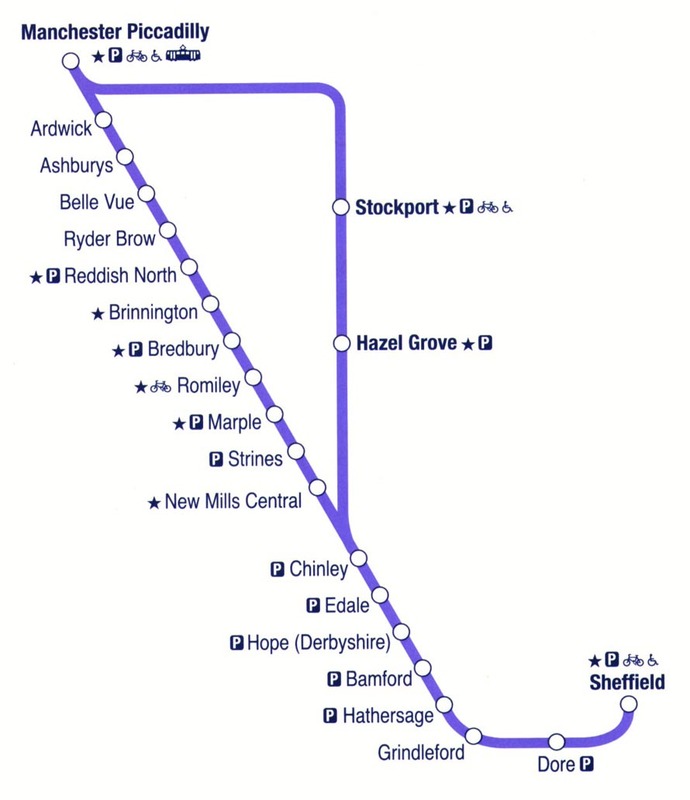 Crewe and Stoke to Manchester lines have become a loop. 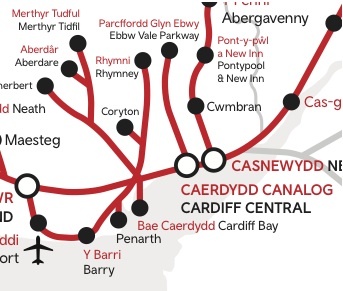 Map is completely out of date as it refers to 'Connect' routes as previously run by Central, EMT have re-organised their services into four groups. And its just a horrible map with no caption for Ely. Dotted lines are EMT occasional services, not 'other'. I've complained about this before, it is based on my map (infringing my copyright) and shows High Speed One running off the Midland Main Line at St Pancras to a dead end. All wrong around Kilmarnock; Lanark shown from Carstairs; Inverness-Aberdeen shown with thicker line than Dundee-Aberdeen. 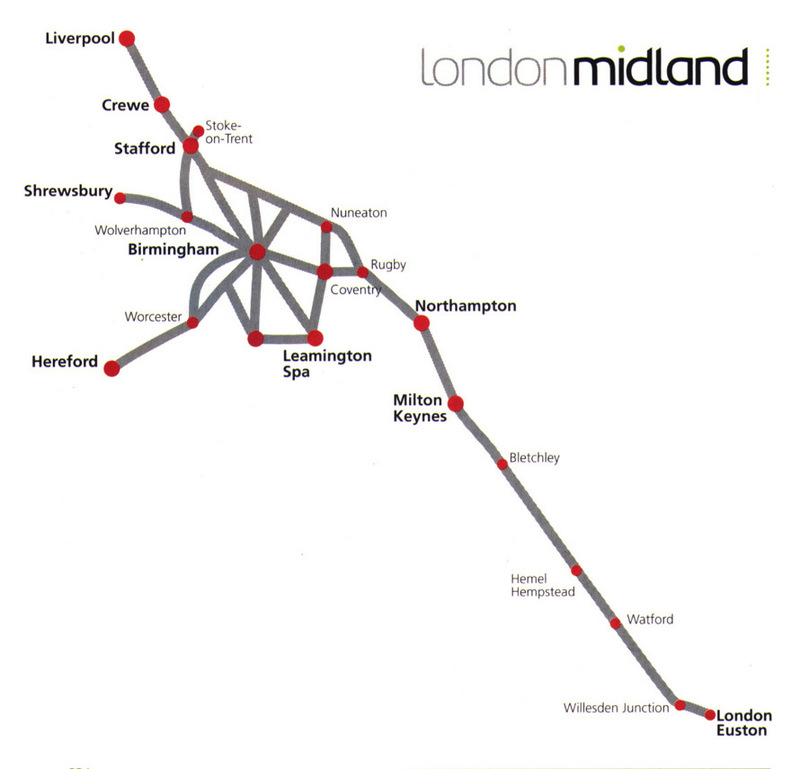 Shows a line that doesn't exist between Stratford-on-Avon and the Birmingham-Bristol main line; London Midland services to Gloucester not shown; Stoke shown right by Stafford. Wrong again in selection of principle/other routes. Stratford-Stanstead service missing at bottom and dead ends onto Chingford branch; Bittern line Cromer curve facing the wrong way; Reedham-Gt Yarmouth line missing. Surely London-Ashford is not the only principal route? 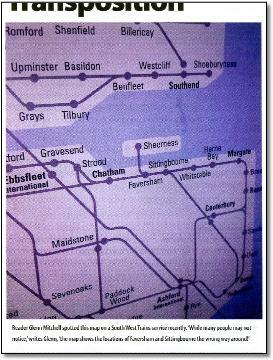 Shows Southern running wrongly to Guildford; Watford route should go to Clapham Junction not Victoria. No salisbury - Bristol route; Reading-Basingstoke is not a principal route. 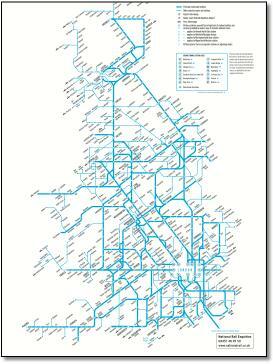 All Transpennine services are principal, Manchester-Cleethorpes for example should be bold; strange line angles around Darlington and Yarm; new Scottish destinations just added on poorly. NET branch shown terminating at Cinderhill rather than Phoenix Park. Tower Gateway shown as a through station on Bank branch; Stratford (Regional) should be at the junction of the two branches. 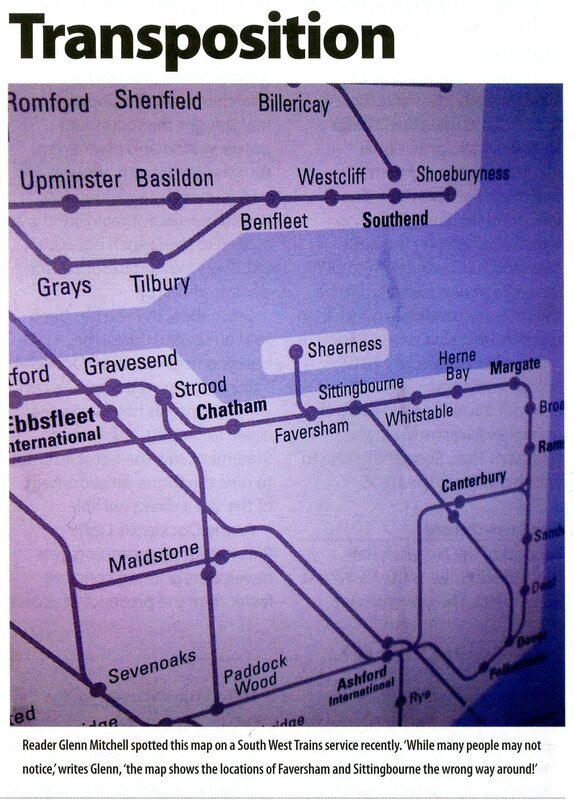 Uses an old map showing a Kingston branch (not now being planned) but no route to Maidenhead, even though it is discussed in the text; shows Abbey Wood branch continuing to Ebbsfleet. One-way loops shown in Croyden but not Nottingham. 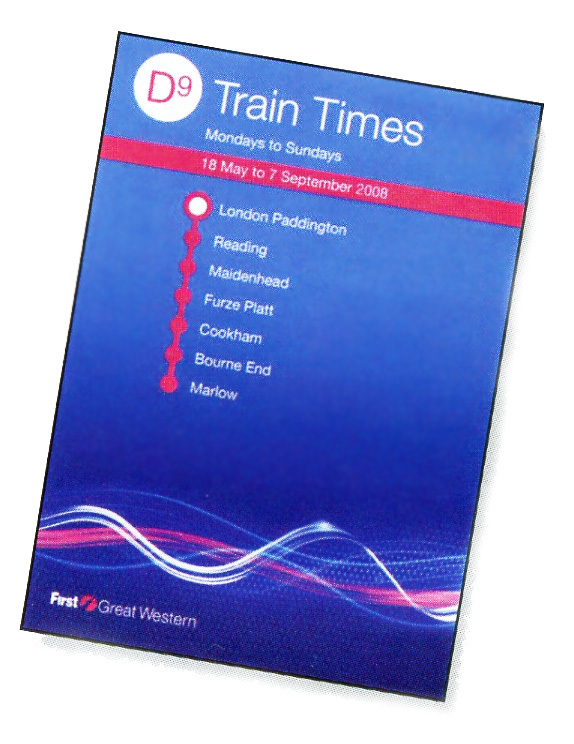 No consistency on use of yellow/blue blobs for stations; the caption 'other routes' is used inconsistently as is the phrase 'for clarity some/other lines may be omitted'. Where amendments have been made to existing maps, the drawing is neither geographic or geometric but amateur. There is an inconsistent level of detail, badly positioned captions and variations on font/caption sizes.